Other Names: Woodsonville, Green River Location: Hart County Campaign: Kentucky Confederate Offensive (1861) Date(s): December 17, 1861 Principal Commanders: Col. The Battle of Rowlett's Station (also known as Battle of Woodsonville or of Green River) was a land battle in the American Civil War, fought in the whistle-stop station of Rowlett's in Hart County, Kentucky, on December 17, 1861. The outcome was inconclusive, although the Union Army continued to hold its objective, a railroad bridge across the Green River. Brig. 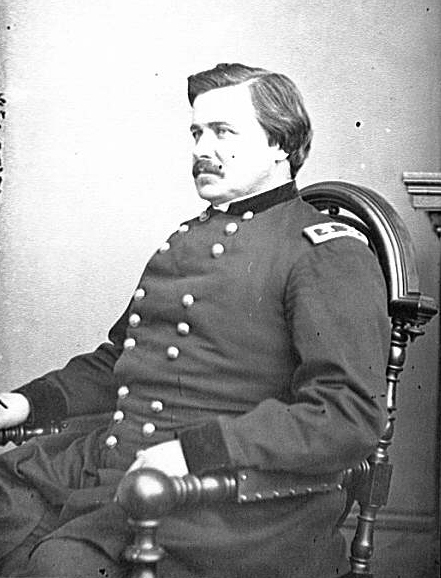 Gen. Don Carlos Buell had assumed command of the Army of the Ohio in November 1861, and in an attempt to consolidate Union hold over the surrounding area, organized a spate of troop movements into the field. Part of these movements included the march of the 2nd Division under Brig. Gen. Alexander McDowell McCook into Kentucky. Meanwhile, the Confederate Western Department, under General Albert Sydney Johnston, had sent out elements that lined up along the Green River near Munfordville, Kentucky. McCook initiated a movement toward Confederate lines, and the rebel divisions, under Brig. Gen. Thomas C. Hindman, responded by blowing up the southern pier of the Lousville and Nashville Railroad bridge spanning the Green River, along with about 100 feet of track, on December 10. Col. August Willich of the 32nd Indiana Infantry sent two of his companies across the river, and had the rest engaged in building a pontoon bridge. The Union forces were mainly men from the 32nd Indiana Infantry Regiment. The particularly notable Confederates were the 8th Texas Cavalry, later better known as Terry's Texas Rangers. The 32nd Indiana Infantry, also called the "First German", was made up of German immigrants and descendants of local German settlers. Col. Willich had assumed command at the request of Governor Oliver P. Morton. He was a disciplinarian, using Prussian bugle calls to direct his regiment on the parade ground and battlefield. The 8th Texas Cavalry was formed by Col. Benjamin Franklin Terry. He was requested by General Johnston to join the army that he was then recruiting, promising him an independent command. The 8th Texas voted to join the general in Kentucky. The bridge was completed on December 17, and four more companies crossed the river. In the meantime, Brig. 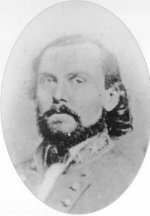 Gen. Thomas C. Hindman directed a Confederate force of Texas Rangers, Arkansas infantry, and Mississippi artillery to destroy the bridge. Advancing into the woods, the Union forces discovered enemy skirmishers south of Woodsonville. The latter retreated until their cavalry joined them, and then attacked the Yankee companies. This was the first time in the Civil War that cavalry faced infantry. The Union companies fell into square formation. The Texas Rangers responded by charging the position wildly. In the ensuing battle, Colonel Terry of the Rangers was mortally wounded. On the Union side, Lt. Max Sachs of the 32nd Indiana and four of his men found themselves isolated by the Rangers, but repeatedly defied their demands to surrender, and they continued to fight until Sachs was struck down. The Rangers charged three times, but were finally forced to retreat. Colonel Willich, who was away at division headquarters at the time, soon returned and ordered a withdrawal to a stronger position. The Confederates, fearing imminent approach of McCook's forces, also withdrew. Both sides claimed victory, attributing grievous losses to each other. While the outcome was indecisive, the Union forces remained in control of the field of engagement, incidentally making recovery of casualties, and the accounting of those lost, wounded, or missing difficult. The forces continued to ensure the movement of Union men and supplies on the Louisville and Nashville Railroad. The 32nd gained nationwide recognition for its stand against Confederate forces at Rowlett's Station, Ky. A detachment of 500 men under Lt. Col. Henry von Trebra fought off 1300 men of Terry's Texas Rangers and infantry under General Hindman. The 32nd formed the "hollow square", and drove the attackers back, losing 10 and 22 wounded, but killing thirty-three of the enemy, including Col. Terry and wounding fifty others. Twelve men of the 32nd Indiana Regiment were originally buried on a hilltop near the battle site. In 1867, the state of Kentucky transferred the remains, as well as the limestone tablet bearing an inscription in the soldiers' honor in German, the 32nd Indiana Monument, to Cave Hill National Cemetery in Louisville, Kentucky. The stone monument is the oldest, intact Civil War monument in the United States. The 8th Texas Cavalry Regiment changed its name to "Terry's Texas Rangers" in honor of the fallen Colonel. The Battle of Rowlett's Station was soon overshadowed by Union victories at Mill Springs, Kentucky, and Fort Henry and Fort Donelson, Tennessee.